43.4 Sukey’s Reverse Quilt Top Completed! After coming back from a much needed vacation, I set up to finish the quilt top for the Sukey’s Reverse quilt for the guild. Last post, I was waiting for some blocks, and with special guidance, was able to ask for last minute help getting the blocks done and to me in the deadline I set for myself. So, just before leaving on vacation, I was secure in knowing I had the blocks in my possession, and the weekend I got back, was able to “vacation de-stress” and make my “at home” quilting retreat to work on the final borders and layout and quilt top for the Sukey’s Reverse quilt. First, I made some of what I called, “magic sashing”. This finished out the larger block design on the outside edge. Another guild member made several of these “inset border” blocks, just the same small block pieces that were in the rest of the quilt. I tested out the “seminole piecing” technique of surrounding these blocks by triangles cut by a quarter square triangle method. These borders were fun and it’s always fun to “fudge” the numbers of each color needed for the side of the quilt. The quilt is based in blues, so the swirly blue is the main color in the border. But the quilt is also based in some other cool colors, and it was fun to put them into the quilt in addition. 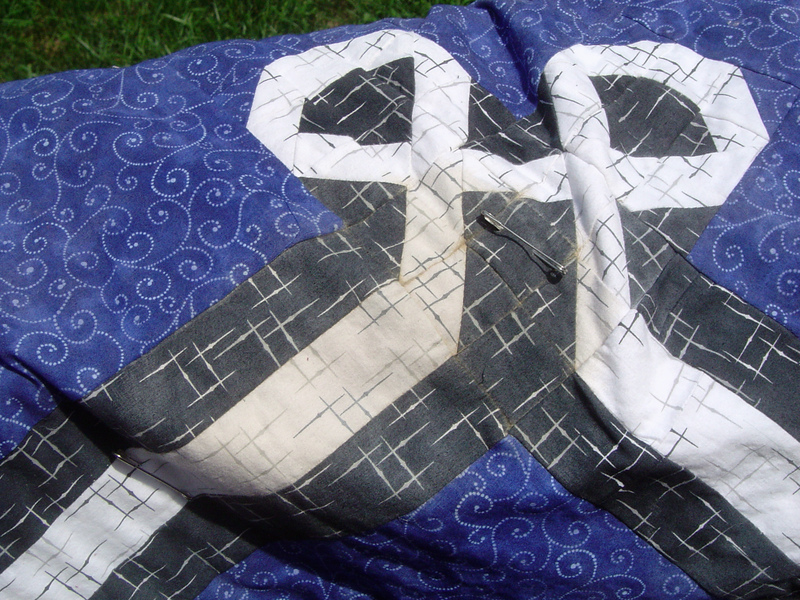 By surrounding the block by the same color as the white (one of the colors of the four patch) the two colored pieces appear to “float” in the quilt. Since I was doing the seminole piecing, I decided one side of the triangles would be the same background, and the other side would be colored. This also makes the pieces appear to float in the middle of the border without being too wild or hard to do. By the end of the weekend I came back, I had the whole top together and pinned to my design wall, and all the pieced borders of the quilt done. Notice how the center fabric was one fabric I had in my stash that leans purple, and somewhere in the middle on each side, is one or two fabrics that lean blue green, but the rest are blue. The following weekend, or maybe it was the one after, I was able to attend a sewing day and get a “stay solid border” in between on the edge of the quilt. I had electric quilt calculated the number of blocks needed for the quilt as I had made, and then got a rough idea of the full size of the inner border of the quilt. I was originally going to make the dark border a little narrower, but tried to “size up” a little bit to try to match the pieces on the outside. I was close. So very close. Different adjustments might have had to be made as necessary. 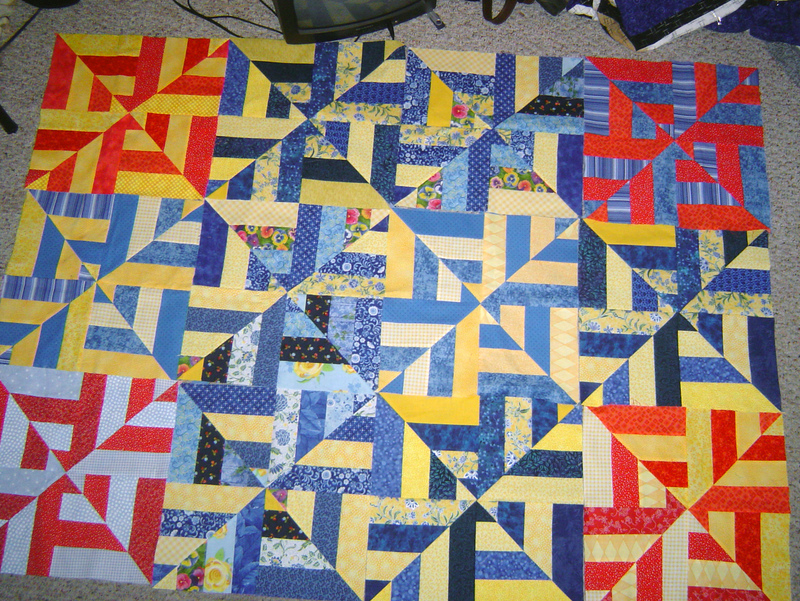 Turns out each pieced border was 0.25″ too long. Trimming it up, I now have added my quilt borders shown above to the edge of the quilt. The edge of each of the side borders is also the same background color as the rest of the background. This made it really easy to be able to trim up my slightly too long pieced borders without sacrificing the design. Also lucky me that after sewing was only 0.25″ off! I was going to add one more dark border (hard to see in the picture above, but dark blue/blue-purple is the inside border). This quilt is measuring 103.25 by 90.25. and this part is done up to here. 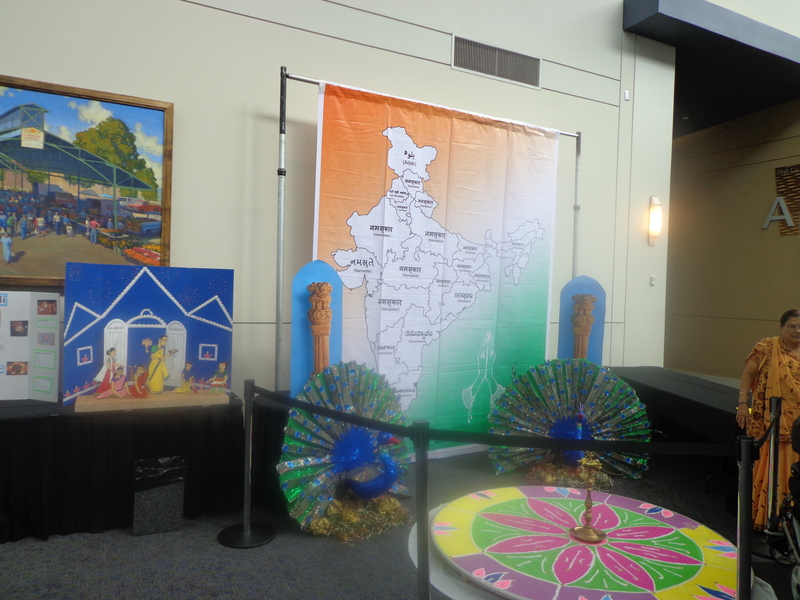 I am hoping to turn it over to the quilter to have it done in the late winter/early spring for the 2019 fundraising. Lots of work, a few “rouge blocks”, lots of cajoling or reminders of getting the blocks back, and lots more organization than I really wanted to do. At the end, I did push my guild members to get the blocks done. But contrastingly, I did push myself to get the rest of the quilt done also. Most large chunks of spare time on the weekends so far in the last month and a half have been doing something more on my part of this quilt. I was pretty exhausted this year doing all this guild work for 2018. Doing a large part of putting together the guild show and putting this together also, not a great idea to do both around the same time frame. Maybe if there was only one or the other, it would have been a little more manageable. A few personal items in my life early in the year, and extra hobbies this year have pushed everything so squished for 2018. But even with all the issues, prodding, pattern writing stress, I am happy with the quilt as it is. I find it funny that my extremely scrappy blocks made first almost look out of place. But not. Not really. So many “quilt philosophies” here. I love group quilts and seeing everyone’s creativity!!!! I haven’t quite finished the updated instructions on the borders. It’s been a mish-mash of pictures and ideas so far which I haven’t edited down to a complete item. And it turns out that the borders fit better than I originally planned as they were actually cut. I am going to miss having Sukey’s Reverse quilt in the house! I will need to do a major amount of donations to be able to get the quilt back! Or I could make a second one. A year from now the quilt will be drawn for. A large year and fun year of this quilt in the making. I am also going to be happy moving on to something else for a while!!! I have been sewing shoo fly blocks as leaders and enders for several months during other projects. I started with two 5 inch blocks, right sides together. I did the trick where you sew around the edges of the pieces, then cut diagonally both directions. 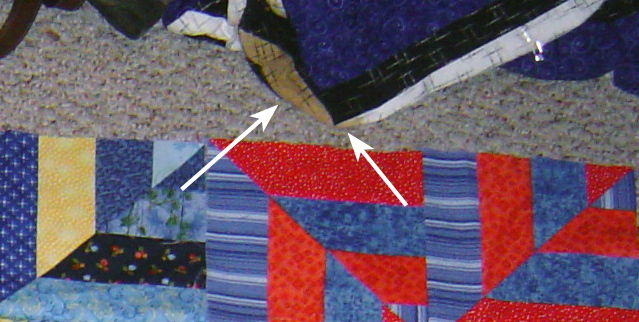 A result is 4 half square triangles that are sewn with the bias edges on the outside. I trimmed these 4 pieces down to a size of 3″ unfinished. Then I collected groups of 4 squares for the background fabric – white in this case – also cut to 3″ unfinished, and a random assortment of colored middles – also cut to 3″ unfinished. I had these piles of blocks done for most of the summer, just grabbing and sewing together these shoo fly blocks over and over. As you can see a shoo fly is a 9 patch block with the 4 half square triangles on the outside corners. The outside corners color matching the background squares in the middle of each 9 patch block. At the retreat I recently attended, I put them up on the “design wall” with a possible plan that I had tried not to talk myself out of over the last few weeks. I saw a design first on Pintrest, a disappearing shoo fly block from Tuxedo Designs blog. So that’s what I did, I cut the shoo fly into squares, sewed them all back together to make the disappearing shoo fly quilt. 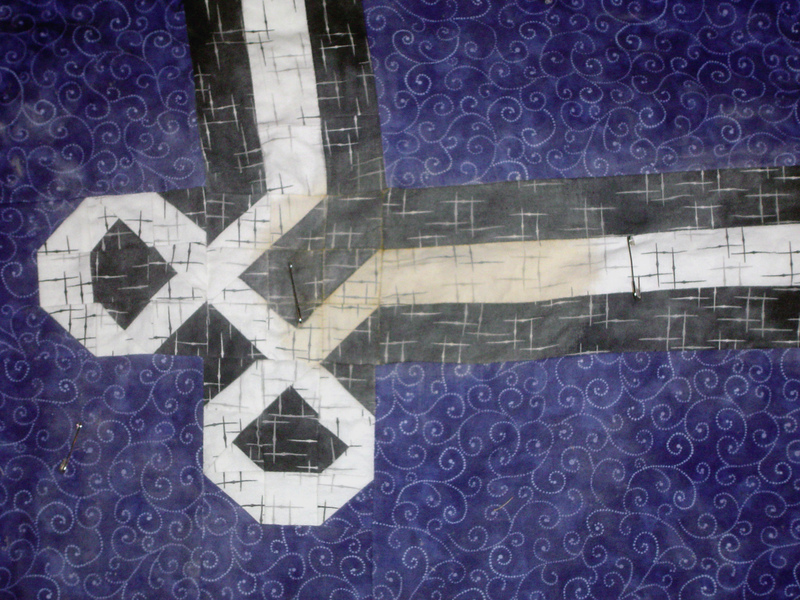 Here’s a picture of the quilt as it was on the wall before it was sewn. As you can see, I tested it out first using just 4 blocks (leftover blocks), so I have a mini quilt from this too! And here, as a “tabletopper”. I honestly don’t know why this design isn’t more popular. It’s pretty easy to do and I love the resulting rows that come from it. Really once you get the quarter blocks made, they only rotate two ways, up and to the left, and down and to the right, alternating each row/column. How fun is this top?! One major benefit of my annual March-A-Long is that often times to help fulfill my self requirement of 15 minutes of sewing a day, that I dive onto Quilter’s Cache or into EQ7 and start looking at new quilts, new blocks, new ides, new patterns. Also, working on the long-ago formed Weave Quilt last month, made me think about other quilts that I have been close on. Figuring out what steps need to be done to finally finish those that are close or “oh so close” that sit in the corner unused, unadmired. I have been wanting to get back to work on the longarm again, but to do that, I needed a quilt that was ready with a finished backing. I end up piecing like “all” of my backs for some reason or another, I don’t like buying backing fabric. And I have been about 16 inches short on a back for my samurai Sudoku quilt for a few years now. So close. I have the pattern for the quilting picked out, I have the hours prepaid for renting time on the long arm. But my aversion to phones & appointments, and the not finished back has kept me down, kept me from getting another bed sized quilt done. Until this past weekend. Whoo! The back of this monster is done! This does not fit in my living room. Luckily, I just had to make the backing a little larger. I hope it is square enough. I even sewed the zippers on because I knew I wanted to quilt this one next. As much fun as it would be to do custom quilting on this quilt, I don’t have the time or energy to do so, I have a large pantograph for this quilt that I bought a few years ago when I finished the border. And finally I had an open day off with nothing else planned, and so decided to call to rent time on the long-arm. Thanks to the guild for having a long-arm panel this last month and opening up the conversation to getting quilts done that way. And I have an appointment for friday. I hope I remember it all! I think I will! And then since I was on a “finishing up borders kick” I decided to stop where I was on the gemini sky quilt, which in my mind I had been wanting something else on the borders than what I had already done. And I finished pieces for the backing on this quilt too. since I was thinking about backings. And then thought of 2 other things to do to other quilts, other ideas for new quilts. Neither of which are matched up yet, and I misplaced something I need for one thing. My hand appliqued hot air balloon has the perfect backdrop once I figure out where I stashed it. I am excited to get these old items done & done. Then I can say I completed more than like 1 quilt in 2015. I would like to do more of these. Maybe as a series. And since I wanted a “dice bag” for my carcassonne tiles. I made 2. One for me and one to sell at the quilt show. 2nd one is the same, but not pictured here. Anyway, wish me luck. I am heading friday to quilt the samarai sudoku quilt, and then saturday to play tabletop games for tabletop day. Looking forward to my long weekend of fun! I have brought back out this quilt from last fall / this spring since there was finally a break in other quilting projects. I had this all drawn up & decided in my notes from February retreat. Took me a while to make certain that the original two red fabrics I purchased were going to work. And they do. I am so excited about this, even though I have been otherwise distracted from quilting due to shiny new computer program (aka game). Last weekend I got the cathedral window blocks done, and one of the 4 border middles. Today I got the border middles done to my liking. And here’s a shot of the rest of the quilt done as far as it is at this time. Well there is a bottom border that it not shown due to poor photographing techniques. Actually there is NOT adequate space in my house to finish working on this quilt, not really. I think I would like to see how another darker solid border would look at the very outside of this design, but there is no way I have the space to see it correctly. Not in my house at this time. Well, I haven’t been sewing idle, even though it feels like it. 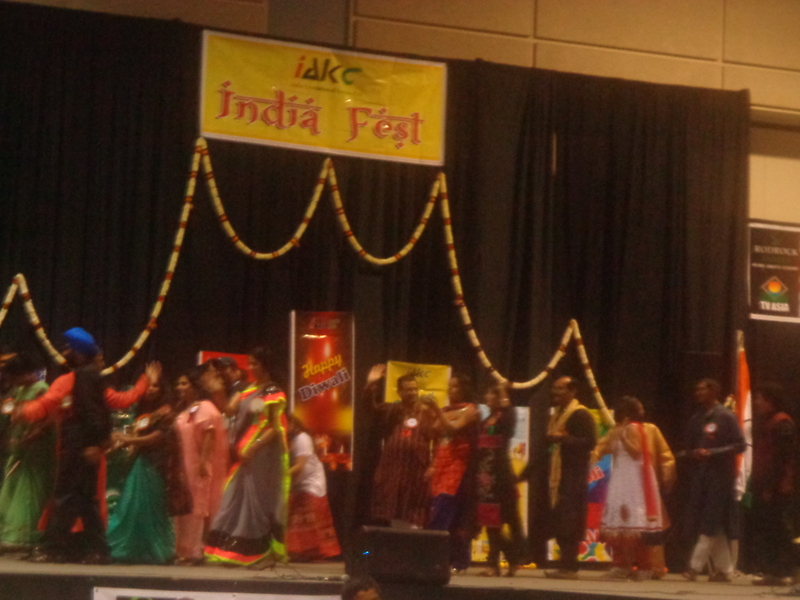 Last weekend I went to a craft fair and a festival about India. Unfortunately as you can see the picture is blurry. There was a smudge on the lens that was on it all day which takes away from this totally unique experience. 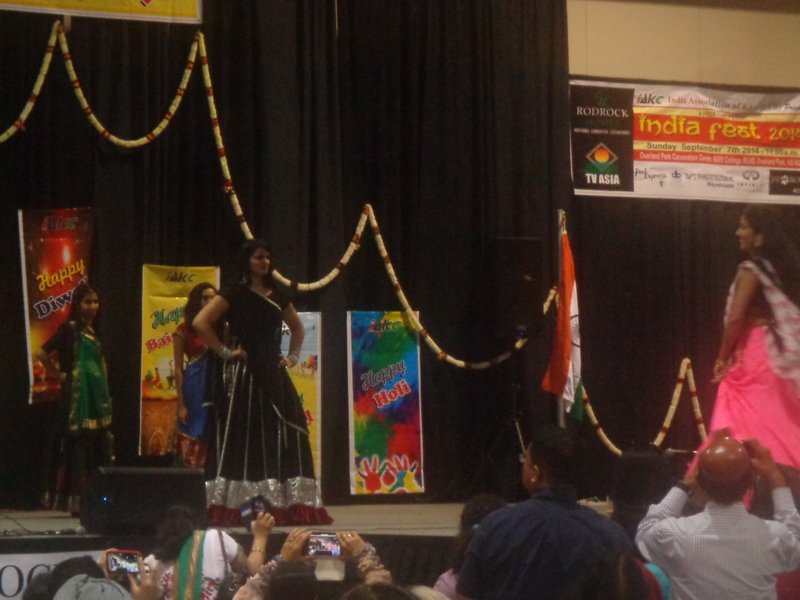 And I will post a couple of pictures that aren’t TOO bad of all the traditional Indian dresses. 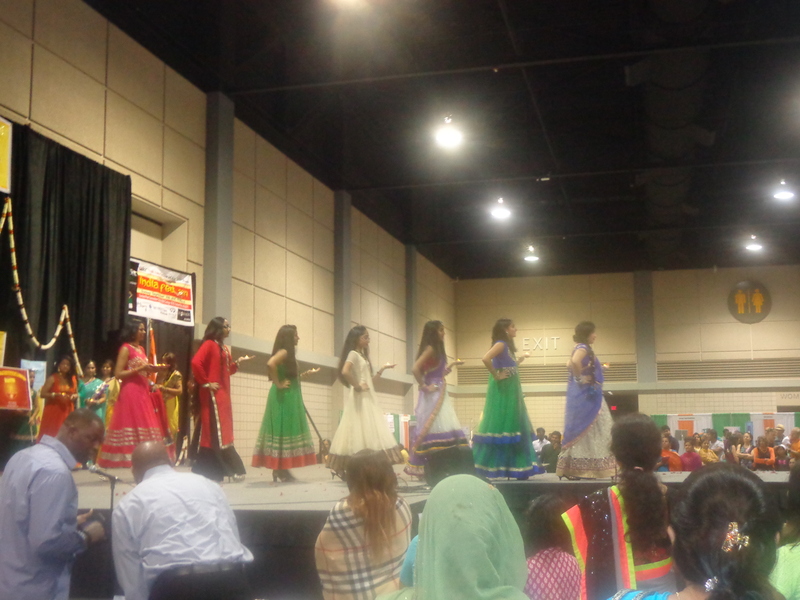 Fashion show was amazing! What variety! 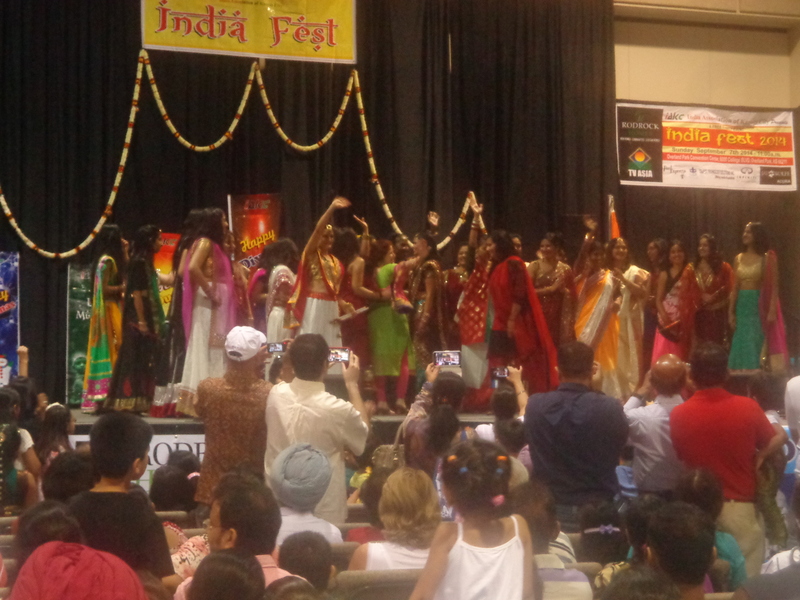 And music, and dance, and food, and vibrancy! The main thing I worked on at the last quilting retreat, and the last two weekends since, has been the Kings Puzzle quilt. This past weekend I finished sewing all the blocks together and all the sashing together in the blocks. The original pattern done with a light background and dark red blocks. Our LQS had a light background and blue for the dark areas. And I had thought I was going to attempt this a year ago, and at that time I had cut out strips for all the dark reds. But I was missing something. I didn’t quite have enough fabric for the whole quilt to be that red & that black. So in my mind I set out to do 3 different colors of reds. A dark, medium & light, but all very saturated reds. Two days before leaving on retreat I found the right color of ‘bright (light value) red’ for the quilt, and I had already bought the other two reds. It was hard to estimate how much of each red I would need since I knew I was going to separate out the middle and edge of each design. 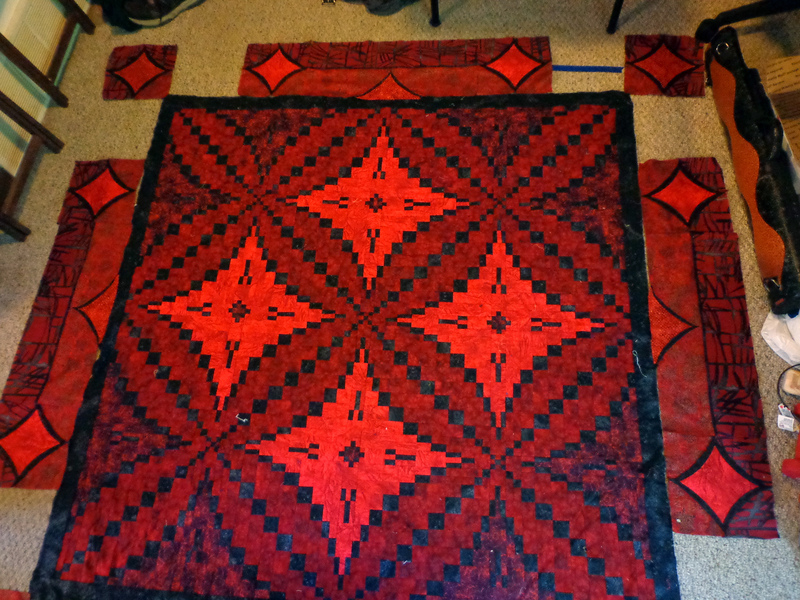 In fact I pretty much ran out of (twice) the middle color of red that dominates much of the quilt space. Before I started actually cutting this time around, I did some diagramming & thinking. First I had to know the general area for medium & dark & light and then I had to count them. Never underestimate symbols and colored pencils in helping plan out things. I used symbols such as L for light, D for dark in sections that would be important. And then I just had to flat out count what I had. And then I redrew the strip sets & calculated (wrongly originally for the row 6 actually) how many of each I would need based from the drawing I had done above. And then I had to estimate how many strips to make of each color and label, label, label. And then I could make strip sets. And then cut the strip sets into strips for the final blocks. And then get the strips in order to make the blocks. After making several blocks. This was the last afternoon of retreat how far I was some time in the middle of that afternoon. I worked then on getting all the sashing complete (or close) before leaving the retreat center. And so upon coming home I had a few sashing pieces to rip out because when I changed one of the long sashing sub-pieces, I didn’t rename it a different name and so didn’t create enough smaller sub-pieces of the right size. And then a few blocks to complete. And so now I have the top complete, minus borders. Good thing I had things ultra organized & sticky noted and grouped & pinned. It helped tremendously in getting the thing together without wanting to tear out my hair. Or stop. I would have stopped on this, I never would have gotten back to it. Not complicated, but very time consuming. A true bargello? I don’t know, but it is of the same style, strip sets broken up & resewn together. And a border fabric? I have two possibilities! I have yet to find a good name for this quilt. The quilt is based from a Craftsy pattern called Hexadaisy. I first made the original in rainbow colors, and had the quilt auctioned off for charity. I discussed a few times the hexadaisy pattern, but mostly here. But then I wanted to make one for me, a larger quilt. I have finally finished the top of this hexadaisy hex ring. The middle part that I made for the auction in July was a little bit smaller than this, the original size of the pattern. The post where I was very frustrated at the FMQ of my old vintage machine is here if you want to relive my stress over the auction quilt. But my mind couldn’t just leave it alone after seeing the ease of these two pieces for the pattern. Originally I tried to push myself to get both quilts done before the July quilt show, but then I took a quilting siesta of 2 months straight, which I probably needed, and then just focused on the deadline stuff first. But I never forgot the other pieces I had planned. I had to get grayscale for my grays to make sure they were gradating correctly. And then I modified the piece slightly and created diamonds using 95 % of the original pattern to make this. Light in the middle, darker toward the outside. And then settled on the inside grey for the outer rings. And I came to the last retreat with the whole thing done and some of it pieced together. I was going to call it hexadaisy squared, then hexadaisy cubed, then hexadaisy hexed, then hexadaisy hex ring (which sounds just slightly off of something naughty), now I am thinking Hexadaisy Rings. Ideas? Offshoots of this name? I am not going to square up the sides at all, but I am considering putting in some built in supports into the finished quilt (which is way far from being quilted as of right now). A lady came to our guild over a year ago and showed how she was able to make her quilts hang sideways and length ways and hang straight using wooden supports sewn into the other sections of the quilt. I want to try that too. I want to make sleeves on all 6 sides so I can rotate the quilt when I hang it up depending on which way I want it that day. When we took our group picture from the retreat, I occasionally rotated my quilt so some people got orange on top, some people got purple on top. Way cool. I also have the binding picked out & even pre-made, but I can’t find it currently so no picture of it yet. Apparently early last week my quilt came into contact with some oily rags that were used in changing the oil in the truck. The rags were moved as soon as I saw them, but apparently not soon enough. I noticed this stain yesterday when I was using the floor as a design wall. So after a few days, this stain is set in. The picture below is after rubbing with talc powder to try to absorb some of the oil off the fabric. As you can see, not awful, but still not gone. Also not quilted yet, I have been rubbing the talc over the stain with a toothbrush from pin to pin. This quilt is also 505 spray basted. But needs to be washed. To solve the problem I thought of thread basting this quilt so it can handle washing without losing the basting or rusting of the pins. Thanks to a suggestion or two, I have some washing techniques, dawn detergent, orange detergent. I also know that if I thread baste and ‘pretend bind’ using the backing as a temporary binding, I can handle getting this quilt wet … otherwise I was wondering if I had to have this quilted before washing. I can’t get the thing washed yet today, but will try to do this week, maybe Sunday? I still have to hand baste this before getting this wet, and try another go with the talc. The picture above was taken yesterday, and the picture below is taken today. So progress with talc removing some of the oil is helping. There is quite a bit of powder still on this so it may be obscuring the full set of damage. Oh, and did I say it smells like motor oil and ‘foot powder’ (the talc I’m using)? It’s the strip twist blocks from the swap I did (back in December?). I finished a few of the missing blocks with some of the scrap fabric swap pieces and dug into my stash. Isn’t it a beauty? And here is the oil stain as I discovered it when laying these new blocks down. See that? 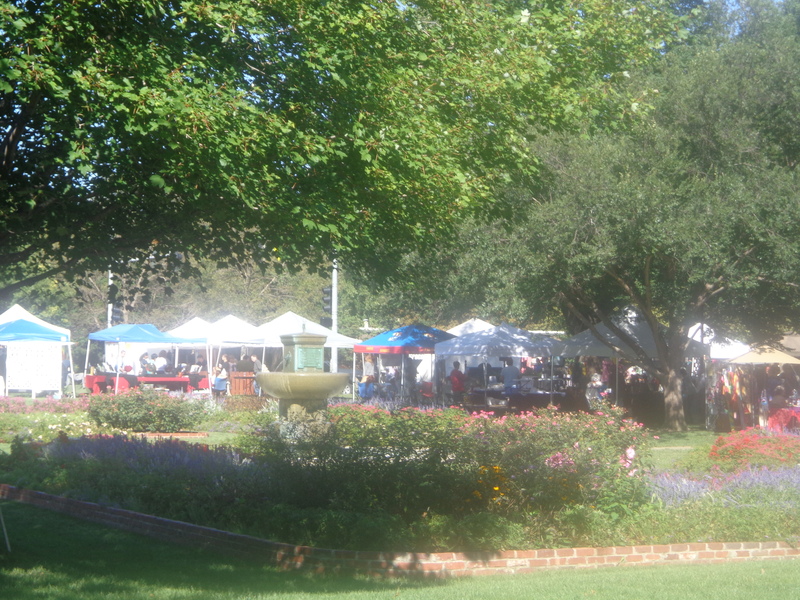 Just above the red block on the left. Pretty dark oil stain. How did I not notice this before? So the hurricane quilt is doing better than it was yesterday when I first discovered the stain. That picture looks pretty dark in comparison to how I see it now. Too bad the motor oil took all my excitement for the placement of my strip twist blocks and completely crushed it. And the excitement I felt after I drove a manual transmission for the first time in like 10 years. Can’t have it all. At least I didn’t get too livid. Although I do have to admit I was shaking pretty good for about a half hour as I was piecing the top together … just trying to really calm myself before taking any action. Which helped a great deal.